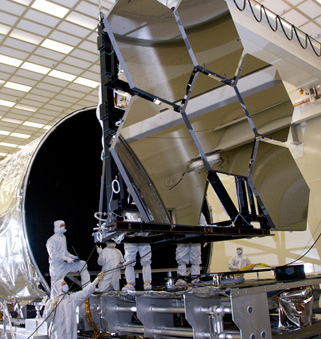 The first primary mirror segment of NASA’s James Webb Space Telescope (JWST) has been polished to its required specifications as measured at operational cryogenic temperatures, setting the stage for polishing of the telescope’s remaining 18 flight-mirror segments in preparation for launch in June 2014, NASA said in a March 2 press release. JWST, a joint effort by NASA, the European Space Agency and the Canadian Space Agency, is a next-generation space observatory that will explore deep-space phenomena from distant galaxies to nearby planets and starts. Cryogenic polishing, also known as cryo-null figuring, ensures that when the mirror reaches extremely cold operating temperatures in space, its shape will conform to the exact optical specification required to collect accurate infrared images of distant stars and galaxies, according to the news release. The engineering development mirror, which will be used as a flight spare, was cryo-tested in the X-Ray and Cryogenic Facility at NASA’s Marshall Space Flight Center in Huntsville, Ala., while mirror polishing was performed at Richmond, Calif.-based Tinsley Laboratories. Additional testing is planned as work continues to assemble the telescope segments. Boulder, Colo.-based Ball Aerospace & Technologies Corp. will conduct separate verification tests using different computer-generated holographic null tools, while Goddard will use its own testing equipment and measurement methods in its clean room. Testing at NASA’s Johnson Space Center in Houston will use a reflective null tool manufactured by optical integration and test partner ITT, and Tinsley Labs will make measurements using its own independent method of calibrating its computer-generated holographic null tools, according to the release.